The Best-Value Corporate Gift This Holiday Season! Reward employees and clients with this outstanding picnic pack. 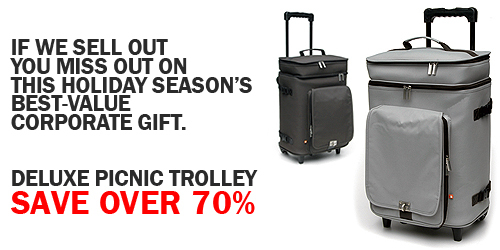 Easily-transportable, premium quality and amazing value, this picnic trolley is sure to impress.With plates, cutlery, wine glasses and napkins suitable for four people, this premium picnic set also includes a chopping board, quality table cloth and napkins, condiment containers, cheese knife and a handy waiter's friend. The huge insulated cooler section of this trolley is large enough to carry all your food and wine and the ergonomic extending handle and wheel system makes it easy to carry around. Fill it with food and wine, throw it in the back of your car, then grab three of your closest friends for a relaxing and memorable day out at the beach, park or wherever! You'd better be quick as there is limited stock available. If we sell out, you miss out!